I am super excited to bring you this week's edition of First Look Fridays, featuring Redken's Creative Consultant of Color, Tracey Cunningham. Tracey is the brains behind some of the biggest celebrities' haircolors, including Cameron Diaz, Jennifer Lopez, Nicole Richie and Molly Sims. Her editorial work has spanned magazines from Vogue and Harper's Bazaar to Allure, Elle and InStyle. In short, she's a master colorist with the roster to prove it ... plus she has THE MOST AMAZING auburn hair EVER. I had the pleasure of meeting Tracey at a Redken color event back in February and she not only can tell in about two seconds what color hair every single person should have, but hers is just the most fabulous shade of reddish brown I've ever seen. (And when she said she thought I could pull it off, I thought I might die.) Read on to discover more about the fabulous Tracey Cunningham! My birthday is the 4th of July which is always a fun birthday! I recently partnered with Byron Williams and now have our own salon, Byron and Tracey, in Beverly Hills. I was born and raised in Seattle, Washington and moved to LA to pursue my career goals. I am a very busy gal but any moment I get I spend with my son Max! How did you know that you wanted to become a colorist? I always loved doing hair but I knew that I had a passion for color. I enjoy mixing the colors and creating unique shades on my clients. I like the science behind the color and the ability to have a career which always me to be creative and artistic. How did you become involved with Redken, and what do you love about working with the line? Since the beginning of my career I have always been a fan of Redken haircolor. Redken’s Shades EQ line gives my clients’ hair so much shine in their shades; it’s a must-have at the back bar. One thing led to another and I knew that I wanted to support Redken and be involved with the brand, and it led me to be Redken’s Creative Consultant of Color. It is an honor to be with such a prestigious brand that supports not only me but the salon, my colorist career, and clients! Every day is a highlight for me in my career! Every day is another adventure whether it’s signing with Redken or coloring a new client! Becoming Redken’s Creative Consultant of Color was a big accomplishment in my career and I am very grateful for them! What do you think are the biggest trends for spring and summer? Spring is the season to brighten and play with your color. My clients like to lighten up their haircolor as a fun way to try something new without going too drastic. For my brunette clients, I’m adding a few highlights and making the base a lighter shade. Think Jessica Biel ... a medium base with caramel and honey highlights to brighten up the shade. This spring, blondes will add more butterscotch highlights for dimension, while still keeping their base medium blonde, rather than platinum -- think Hilary Duff. Redheads will go lighter and brighter without being too dramatic -- think Rose McGowan, she has a strawberry red shade with gold highlights on top to really make her color pop! Bright, light shades are the must-have haircolor this summer. 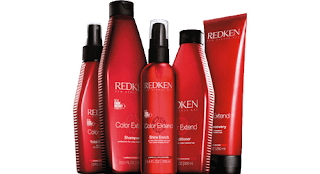 1) I always recommend Redken Color Extend haircare for my clients to use to keep their color longer, healthy, and shiner! 2) Visit your colorist for a Shades EQ Crystal Clear gloss in between your regular color treatments. 3) Quick, easy highlights without changing your hair color! I pull inspiration everywhere ... from the runway to the streets of LA! Everything in my life influences me to be creative and continue to be the best I can be. 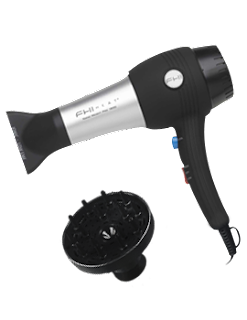 I can’t live without my FHI heat blowdryer and Redken Shades EQ! Playing with hair must be fun -- but what do you do for fun when you're not styling hair? My favorite past time is to spend time with my son Max and relax!